Moisturizing & Gentle. 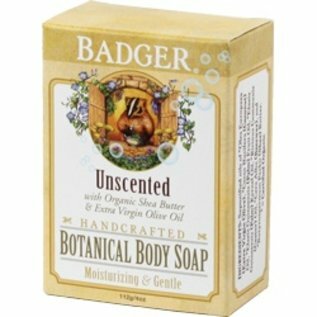 Badger's unscented soap is moisturizing and non-irritating, with a dreamy lather that is exceptionally good for your skin. Created in New Hampshire. “True soap” – handcrafted and hand-cut using only the purest ingredients and traditional soap making methods. What can we say? This fabulous Unscented Botanical Body Soap cleans your skin gently and effectively, without added fragrance, color, or other irritants. This soap is ideal for those with sensitive skin, or those with fragrance sensitivities, but we think it's pretty great for everyone! We would never add any detergents, foaming agents, artificial "fragrance" or color, synthetic or harsh ingredients - just good clean soap! Unscented Soap Ingredients: *Olea Europaea (Extra Virgin Olive) Oil, Aqua (Purified Water), *Cocos Nucifera (Coconut) Oil, *Elaeis Guineensis (Palm) Fruit Oil, *Elaeis Guineensis (Palm) Kernel Oil, **Sodium Hydroxide (Lye), *Ricinus Communis (Castor) Oil, *Cera Alba (Beeswax), and *Butyrospermum Parkii (Shea) Butter.